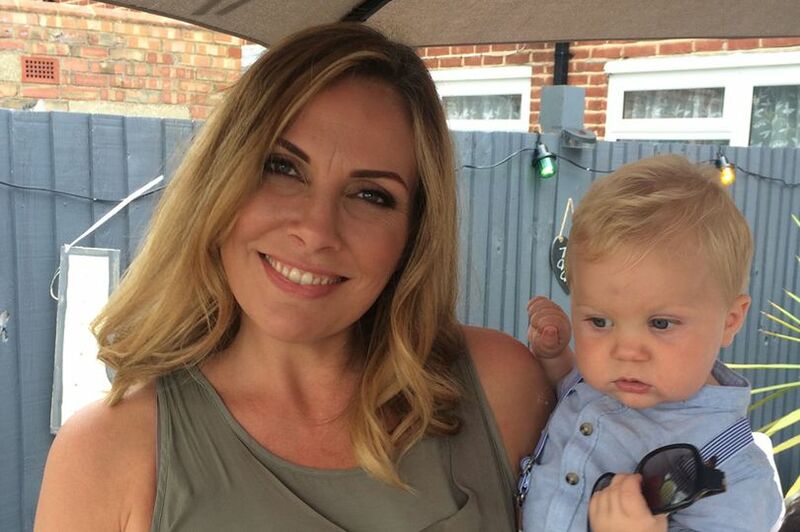 Sarah Valentine, whose youngest child is aged just one, says she is "100 per cent sure" her breast cancer is "emotional"
A mum-of-four with breast cancer plans to cure her illness with an alkaline-based vegan diet after turning down conventional NHS treatment. Sarah Valentine noticed an indentation on her left breast as she danced naked in front of her mum Annie Herbert's mirror on December 3 last year. The 36-year-old was later diagnosed with cancer and offered either a full mastectomy or a lumpectomy, and radiotherapy, on the NHS. However, she defied medical advice by declining both options. Instead, Sarah, from Kent, says she plans to cure her disease through a combination of healthy eating, bitter almonds and purified water. She has overhauled her diet to eliminate meat and dairy - and says she is "100 per cent sure" that her breast cancer is "emotional". “I’ve chosen the natural way to show cancer the door, pronto,” she said. Cancer experts do not recommend alternative therapies - such as special diets - instead of conventional medical treatment. They say there is no scientific evidence that a diet can cure cancer and that, in some cases, alternative therapies could be unsafe. Never an unhealthy eater, Sarah, who lives in Bethersden, says she is now following an alkaline-based vegan diet. She believes it will give her the best chance of beating the disease, which has previously affected numerous members of her family. By slashing acidic products, meats and even grains from her daily menu, a typical meal for her now comprises seeds and vegetables. Sarah plans to buy a costly vitamin C and sodium sultanate drip, to boost her intake and regularly takes iodine supplements and bitter almonds, a source of vitamin B17. She also takes Golden Paste – a product made up of turmeric powder, water, oil and pepper – every day. And she has invested in a £300 water filter, which she attached to her tap, to purify all her water. Sarah said she hopes her extreme measures will reverse the progress of her currently Stage 1 cancer, which is made up of two tumours measuring 2.1cm by 1.7cm and 1cm by 1cm. The mum, whose cable jointer boyfriend, Richard, 35, backs her decision, knows some people will think she is making a mistake in declining conventional treatment. But she is adamant her decision is the right one. “I’m a mum to four children - Jesse, 15, Poppy, five, Teddy, four, Billy, one,” she said. “They are my priority and I am not irresponsible. “This is not a diet, it is life and death. “I think by feeding my body good things, it will have an impact. I’ve done a lot of scientific research into it. Sarah also believes that surgery could damage her health. She continued: “I think I stand a better chance doing this than having a mastectomy straight away. “I believe if I had a mastectomy I would be dead within 10 years. “This is about healing my body back to health. “I’m 100 per cent sure that my cancer is emotional. Sarah’s diet was never bad. She would eat free-range eggs, well-sourced meat and good quality butter. She was also careful not to take hormones in tablets or her food, and favoured natural products. “I used bicarbonate of soda instead of deodorant, never had any hormones in pharmaceuticals or food, ate healthily and breastfed all my children,” she said. Sarah discovered her lump after stepping out of the shower and dancing in front of a mirror at her 60-year-old mum's home in Bermondsey, south London. “I thought I’d lost weight, so was dancing around a bit,” she explained. Two days later, on December 5, Sarah headed to her GP, who referred her to the breast clinic. On December 19, at Buckland Hospital in Dover, Kent, she was examined. Concerned, the doctor referred her to Kent and Canterbury Hospital, Canterbury, for an ultrasound, needle biopsy and mammogram. But it was not until December 30 at William Harvey Hospital in Ashford, Kent, that Sarah's cancer was confirmed. “I knew already,” she recalled. Sadly, this is not the first time Sarah has been affected by cancer, with a number of her close family members having had the disease. Her childhood friend, professional footballer Ernie Cooksey, died in 2008, aged just 27, after battling skin cancer. “Maybe my experience of the illness has made it easier for me to cope,” she said. “I’ve seen people go through chemotherapy and be very ill as a result. Now, Sarah is speaking out to make people aware that breast cancer can affect anyone and that a lump is just one sign. She hopes to get #Shakeyourtits – a hashtag encouraging people to examine their breasts for changes including lumps, indentions, changes to the skin and bumps – trending. Sarah, who has left her makeup artist job to concentrate on getting better, is raising money to fund her natural treatment. “I need to get vitamin C drips, supplements, a water distiller, thermo imaging to check tumour shrinkage and hormone-testing reports,” she said. On its website, Cancer Research UK states: "We don't recommend alternative therapies in place of conventional medical therapy because there is little (if any) scientific or medical evidence to back up the claims that are made." Cancer Research UK's Martin Ledwick said: "There's no evidence a change in diet can treat cancer. Alternative therapies could be very harmful, so shouldn't be used instead of conventional treatment." Sarah has set up a GoFundMe page to help raise money for her natural treatment.